A brief extract of evidence contained in the recently published book “ALEXANDER THE GREAT WITH HIS FAMILY ARE BURIED IN THE ROYAL TOMBS OF VERGINA” by historian researcher Triandafyllos Nt. Papazois. Below one can find the presentation of just a few of the several important arguments on which is based the doubtful correlation of king Philip B’ with tomb II, as well as the conviction that Alexander the Great with his family are buried in the royal tombs of Vergina. 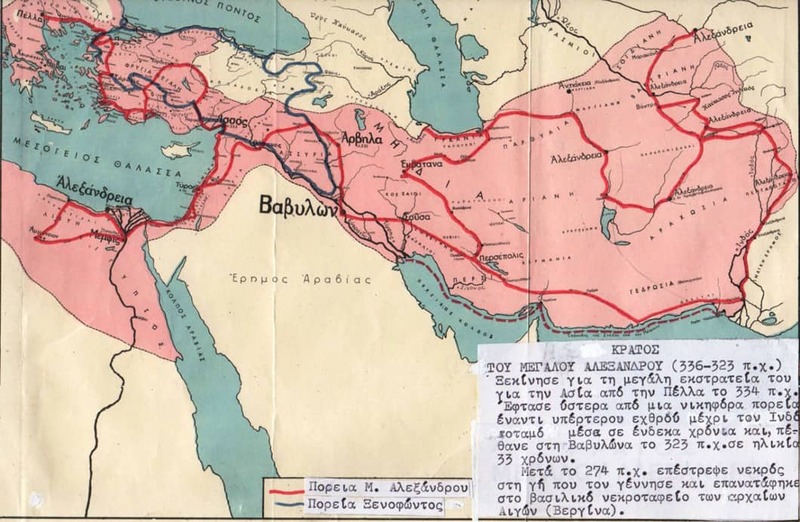 Ancient historians have provided us with ample and, mostly, accurate evidence concerning the expedition of Alexander the Great from Northern Greece (Macedonia) to Asia and Egypt; therefore, we know about all his activities in detail. On the contrary, certain ancient sources with information concerning Alexander’s death, tomb and the fate of his remains have often been proven to be vague and questionable. Their fictitious elements give rise to questions and make us wonder where the great field marshal was finally buried along with his family. It was in1977 that Professor Manolis Andronikos discovered three royal tombs at the very same place. Two of them (II, III) were found unpillaged; Tomb II was attributed to King Philip II and his last wife, Cleopatra; Tomb III was named “The Prince’s Tomb” and Tomb I was called “Persephone’s Tomb”. Professor Andronikos in his book refers to the pillaging of the royal tombs by Pyrrhus, but claims that “it was by mere coincidence that the tomb of King Philip II escaped from being pillaged”. 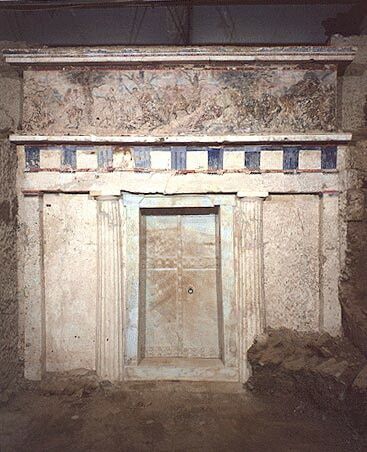 However, this tomb was well known to everyone and would have been impossible for it to have escaped, just like no other royal tomb in Vergina escaped before 274 BC . This error of facts was significantly reinforced by the conclusions of a group of British scientists under Anatomist Dr. J. Musgrave, who supported in their report that “…they succeeded in restoring the head of King Philip II based on the skull bones discovered in Tomb II” (Transactions of the International Congress of Classical Archaeology XII, Athens 4-10.9.1983). However, neither the skull nor the skeleton of the dead, as one can conclude from ancient historical sources, belong to King Philip II. It has been proven that these remains belong to another dead king who was buried in the same tomb after 274 BC. The bones of Tomb II do not belong to King Philip II and his last wife, Cleopatra. The same conclusion was expressed in the relevant report by Mr. N. I. Xirotiris, Professor of Anthropology at the University of Thrace and his colleague, Mrs. Franziska Langenscheidt (Archaiologike Ephimeris 1981). This was also later confirmed by Mr. A. Bartsiokas, Professor of Anthropology as well (Science Magazine, 21.4.2000). Historical evidence leads to the conclusion that in 316 BC King Philip III Arrhidaeus was buried initially in this tomb by Cassander, following his murder by Olympias in 317 BC at Pella (Pausanias). King Philip II was buried between 336 and 335 B.C. in the adjacent Tomb III. There is important evidence proving his identity. After Pyrrhus was driven away in 273 BC, Tomb II was prepared by Antigonus Gonatas and acquired the form we know today with the Hunting Scene Mural; this hunting incident had taken place in Bactria in 327 BC, nine years after Philip’s death (Arrian). The rider seen in the middle on the mural is Alexander the Great, while both King Philip II and Philip III Arrhidaeus are missing. Alexander’s attire confirms what Diodorus Siculus writes that in Persia “…he wore a white tunic and a Persian belt without Persian breeches (anaxyrides)”. Also what Herodotus writes is verified, i.e. that “in Persia, those who were about to make a sacrifice wore a wreath of myrtle leaves” (as the mural confirms). As for Professor Andronikos’ view that the lion-hunter on horseback is Philip II, because of his physical similarity to the king, Papazois holds a different point of view. This is the chief of Alexander’s body-guards, Ptolemy, son of Lagus, who – according to ancient sources – was the biological son of Philip but in name the son of General Lagus, since Philip had given to Lagus the boy’s mother, Arsinoe, Philip’s concubine, as a wife while she was pregnant (Ploutarch). It was, therefore, natural for the young man to look like his natural father, Philip II. Hunting wild animals was considered truly dangerous and it was common sense that those participating in the sport should be physically fit, bold, quick-thinking, experienced and agile. Philip III Arrhidaeus suffered from a physical disability, an incurable mental disease, was mentally retarded and after the death of Alexander the Great was made king due to the order of succession to the throne, given that he was Alexander’s half-brother and there was no other successor, other than the expected son of Alexander (Ploutarch, Diodorus Siculus). Therefore, it is out of the question that Philip III Arrhidaeus was the lion-hunter on horseback. The view that the body was transferred directly to Alexandria where it was buried (Diodorus Siculus) cannot be supported as it was technically unfeasible for the magnificent mausoleum to be prepared for his burial. There are also other reasons. Queen Roxanne and their infant child arrived in Macedonia in the same year and were murdered by Cassander in Amphipolis in 311 BC. Their remains were scattered (Diodorus Siculus, Strabo, Justin). 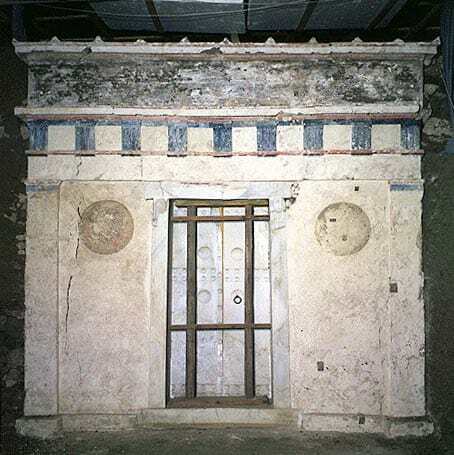 Amphipolis was relatively close to Vergina and it was easy for the remains to be carried to the royal tombs. The first cremation of Alexander’s body, which took place in Memphis, is also verified by – among other things – the fact that according to Professor of Anthropology A.Bartsiokas, most of the bones of the male skeleton of Tomb II “were dry when cremated, after the flesh had been decomposed by burial”. This means that in Vergina we, probably, have the reburial of the same king. 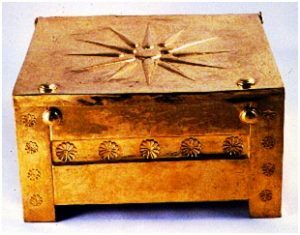 The golden larnax with the 12rays star found in the antechamber of tomb II. On the contrary, according to Pr. Xirotiris, the female bones in the antechamber of the same tomb in comparison to the remains in the main chamber “were scantier and had been soiled with ashes. No bones could be completely reconstructed”. Papazois estimates that the logical explanation for this is that these remains were transported and buried in Vergina from two different places, as occurred in the case of Alexander the Great and his wife Queen Roxanne. Roxanne’s bones, as mentioned above, “had been scattered”, so naturally, could not have all been collected. 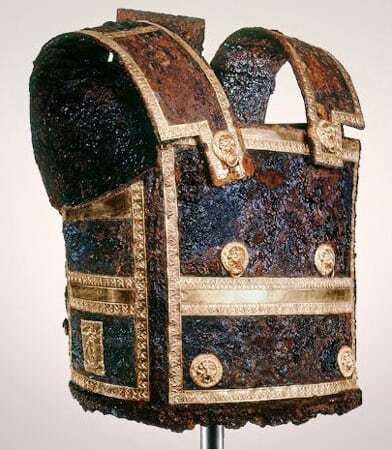 The breastplate (cuirass) found in tomb II. It is almost identical to the one Alexander was wearing in Gaugamela in 331BC. 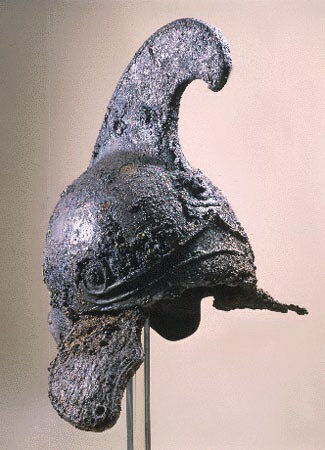 Iron helmet. The head of goddess Athena can be easily seen. 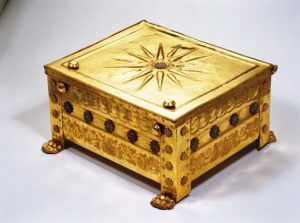 According to the evidence drawn, all personal mementoes of Alexander the Great and Roxanne as well as the field marshal’s arms followed at the time of Antigonus Gonatas, after 274 BC and they were placed next to the royal family in the Vergina tombs, where they were found. Translation of relics of kings who had died in a foreign land to their homeland was a sacred tradition for ancient Greeks. It would have been impossible for the bones of Alexander the Great to be an exception to this rule. As one can also conclude, ancient Macedonians “after two unsuccessful attempts”, did, finally, manage in 321 BC – as all evidence presented in this book confirms – to remove Alexander’s relics from Memphis (Diodorus Siculus, Aelinius). Papazois estimates that this happened before they were transported two years later by Ptolemy A’ or even later by Ptolemy B’ to Alexandria (Pausanias) and were replaced with other relics or an effigy of Alexander’s that may had been seen later by Roman emperors. Papazois mentions that in his opinion it was an effigy (mummy) that was used because, as mentioned above, Alexander’s body was not mummified but cremated; therefore, the mummy they had seen could not possibly have been a real mummy of the king. Egypt had been well known ever since antiquity as a country where they manufactured incredible effigies (Diodorus Siculus). One can form a view on the issue from the book by Egyptian archaeologist Abbas Chalaby, which includes extraordinary effigies of Egyptian kings and princes. The discovery in 1887of the so-called “Alexander’s Sarcophagus” in Sidon of Lebanon, perhaps is not an irrelevant finding in view of the adventure of his relics. No ancient text, of course, has been found that mentions the reinterment of Alexander the Great’s relics from Egypt to Aeges (Vergina). However, Arrian, Plutarch, Strabo and other historians mention that ancient Greek writers had written about “the death and burial of Alexander the Great”, but all these writings had been lost, just like Strabo’s 7th book about Macedonia. Along with all points mentioned above, the detailed study of ancient Greek sources concerning the tombs, the tomb artefacts and the conclusion of Professors of Anthropology about the skeleton, the facial features and the age of the bones, lead to the conclusion – however bold this may sound – that in Tomb II, the tomb under question, there was a reburial of Alexander the Great and Queen Roxanne by Antigonus Gonatas after 274 BC Similarly, twelve-year old son of Alexander’s, Alexander IV was buried in Tomb III. After the publication of his second relevant book (2001) Triandafyllos Papazois had written: “I have serious reservations as to the probability of discovering the tomb of Alexander the Great in Alexandria in Egypt. If this ever happens, I am certain that there will be no artefacts or bones belonging to him, because, as it can be proven, these were found in Vergina. This presentation, which is a brief summary of my research work, contains only some of the many serious arguments supporting why I dispute that Tomb II is that of Philip II and why I believe that Alexander the Great and his family are buried in the royal tombs of Vergina. Full evidence to underpin my conclusions is presented in my book and it would be a challenge for me to present it in public, hoping that this will be a starting point for a public debate that I have long hoped for, so that the great historical truth that has unreasonably been overshadowed for many reasons, does at long last come to light”.